I am trying to find out the names of the A.S.L.E.F. Branch Secretaries for the Three Bridges Branch and the dates they served between. if you have any info please can you let me know. Charlie Osta 1999 - 2004, Ron Pegler 2005 - 2007, Alex Button 2008 - 2010, Paul Eden 2010 to date. This web page is dedicated to all A.S.L.E.F. members who have worked at Three Bridges depot over the years, and it features A.S.L.E.F. 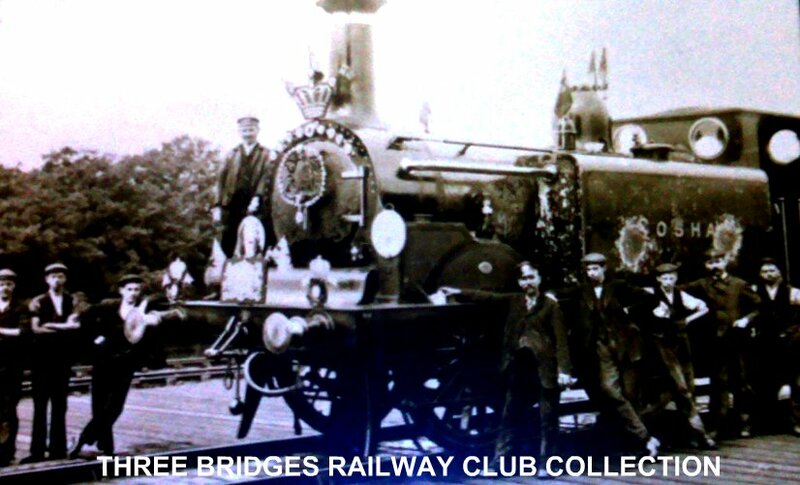 members who brought the trains of Three Bridges to life. Three Bridges locomotive shed was opened in July 1848 by the L.B.S.C.R. (Shed Code 3-B). 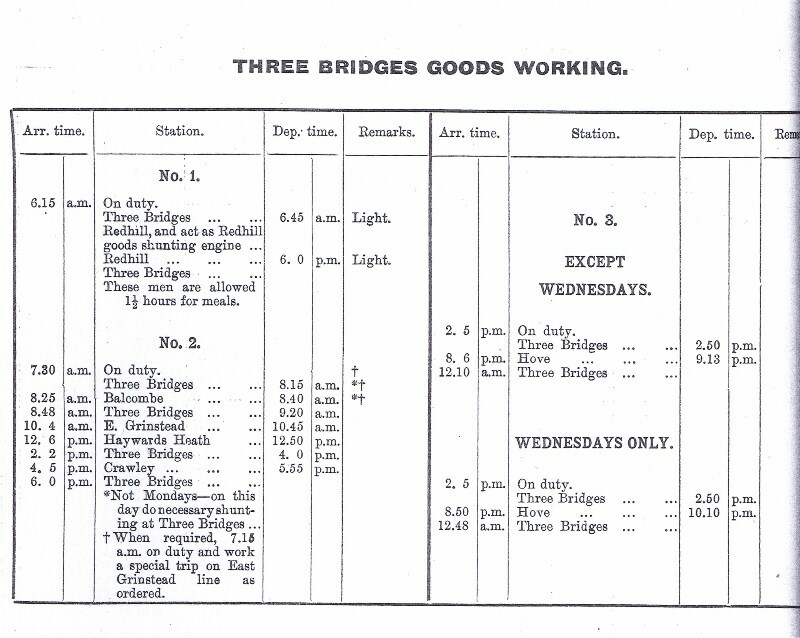 With the electrification arriving at Three Bridges in 1932, this created a new motorman’s depot at Three Bridges (E.M.U.T.) which opened in 1932, along with Reigate motormans depot. 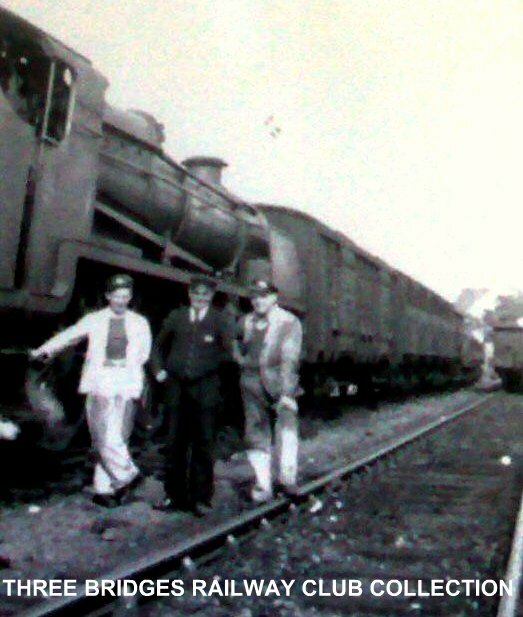 On the left hand side is the original Loco Shed which closed c1909. On the the 12 April, 1858 a accident occurred near Three Bridges, at this station, which 29 miles from London, the Horsham and East Grinstead branches join the main line. The Horsham is miles long, and is a single line. 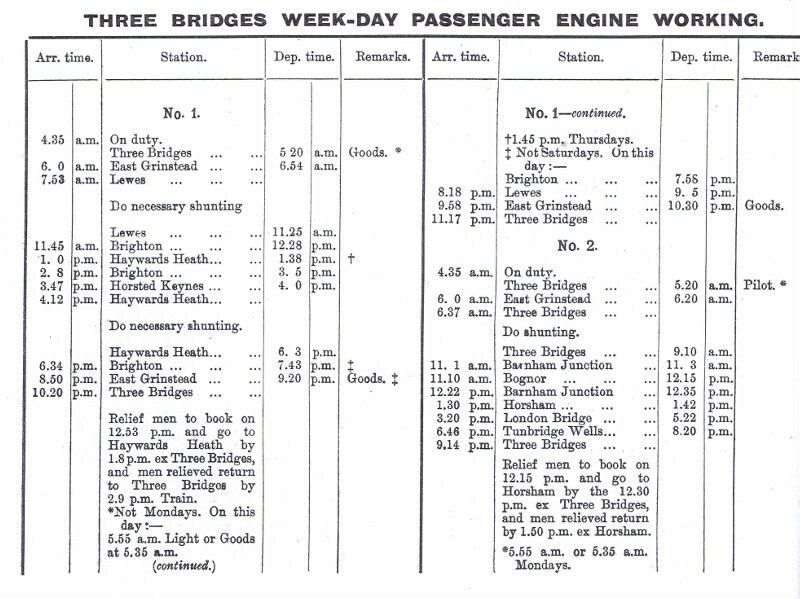 On the 12th April, as a pilot engine which is kept at Three Bridges, but which is regularly employed to take two trains each way daily over the branch, was about to start with the 9.05 a.m. train from Three Bridges to Horsham, it was found that its assistance would be required with the 8 a.m. train from Brighton tp London, which was very heavy. 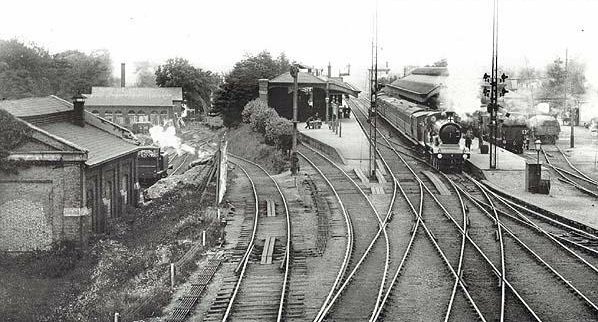 The station master therefore sent the pilot engine away with the main line train, and telegraphed to Horsham for the regular Horsham engine, which would otherwise have waited there until the arrival of the pilot engine with the 9.05 branch train. 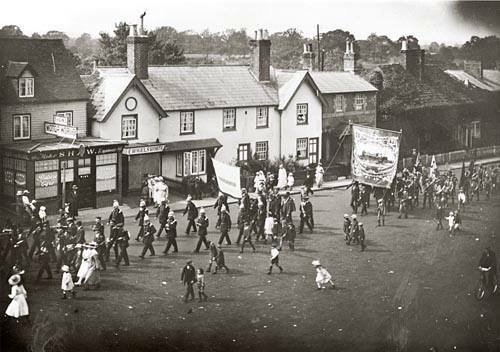 When the message reached Horsham, the Fireman of the Horsham engine was absent in the town getting his breakfast, and by the station master’s orders, the driver started for Three Bridges without him, taking a porter to supply his place. 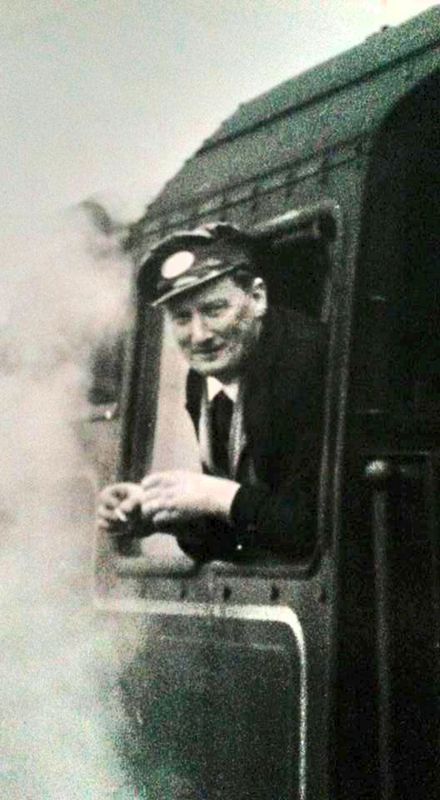 On nearing the Three Bridges Station, the driver shut of steam, and in preparing to stop in front of the carriages of the 9.05 train, which were standing on the siding allowed to them, he told the porter to apply the tender break. The porter did so; and the driver said “that will do,” meaning that he had done enough; but the porter, misunderstanding the expression, and thinking that the driver intended him to take the break off again, turned the handle the reverse way, and caused the engine to run up with some little violence against the carriages, to the injury of two of the passengers who were sitting in them waiting for the train to start. The porter by whose unfitness for the duties of a fireman this accident was occasioned had been at Horsham for four months, and at Brighton for four years previously. 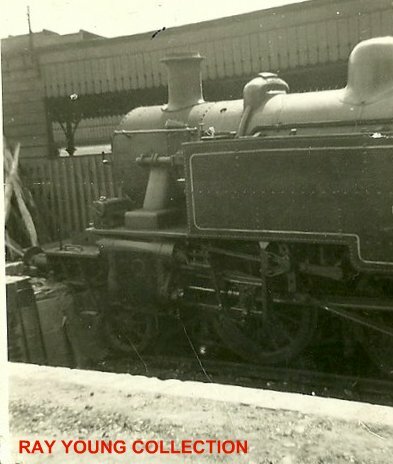 He had been on the engines at Brighton frequently, but had not been in the habit of working the break, and had not travelled farther than 100 yards at a time on an engine before. 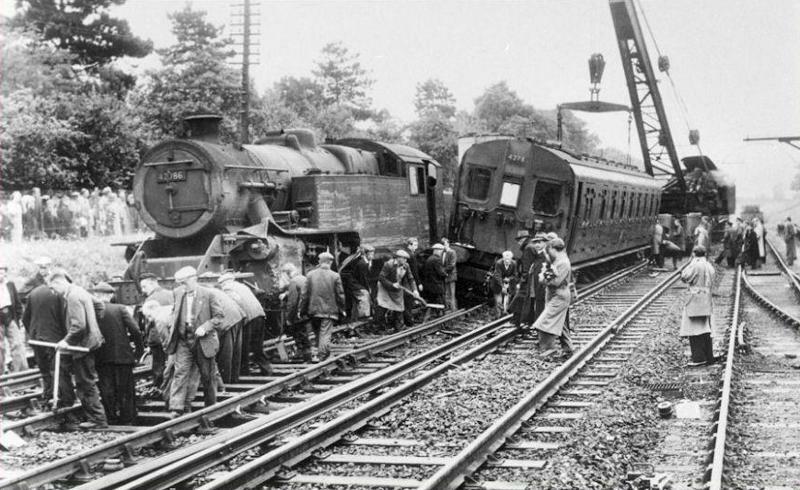 The present accident was caused by the employment of the Horsham porter on a duty for which he was not fitted, and it might have happened equally if a porter from Three Bridges had been ordered to assist the driver shunting the engine from one end of the train to the other, and had made a similar mistake in doing so; so that it cannot fairly be said to have anything to do with the working of the single line; but it becomes my duty not the less to draw attention to circumstance that the printed regulations of the Company and their practice are not in accordance with each other, and to suggest that means should be taken for carrying out that conformity between them which is so necessary to proper discipline amongst the Company’s servants, as well as to the public safety. On the Friday (17th May) I travelled to Three Bridges, another small locomotive centre on the London, Brighton and South Coast Railway, where we had a few members attached to our Tunbridge Wells Branch The object of my visit was to prepare for an open meeting on the Sunday, with a view to opening a branch Brother Harrison, of Battersea, Brother Worcester, of Horsham, and a few friends from Brighton, attended, and we had a good meeting , Brother Smith, of Brighton, was m the chair Brother Harrison explained the whole matter relating to the business done by the delegation on the electric and other matters I then talked to them on general matters relating to locomotive-men in particular, and at the close we were able to declare the branch open and elect the necessary officers for the time being, with a stipulation that I should visit them when the books arrived, so as to explain matters to the new secretary. On the evening of the 21st June, 1868 a 'Craven0-4-2 loco 167 was working a special cattle train from Tunbridge Wells to East Grinstead. Just past Hartfield the driver was warned of an escaped bull on the line, and was proceeding with caution when an axle broke on one of the wagons causing a minor derailment. Attempts were made at once to uncouple and remove the damage vehicle, but before much progress had been made the bull reached the scene, attracted by the bellowing of the frightened cows. 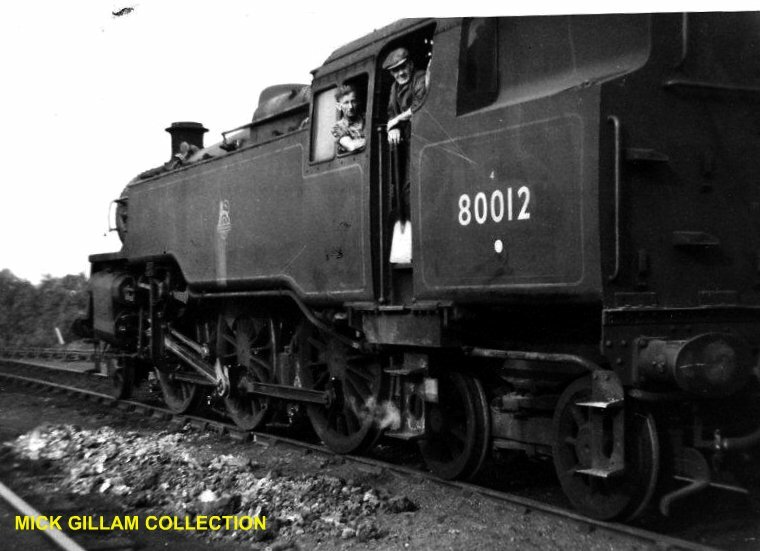 It was then that the only casualty took place, for in his haste to reach the safety of his footplate; the driver slipped on the steps and broke his collar bone. The bull was eventually recaptured with the aid of one of the cows and the train sent on its way some four hours late. 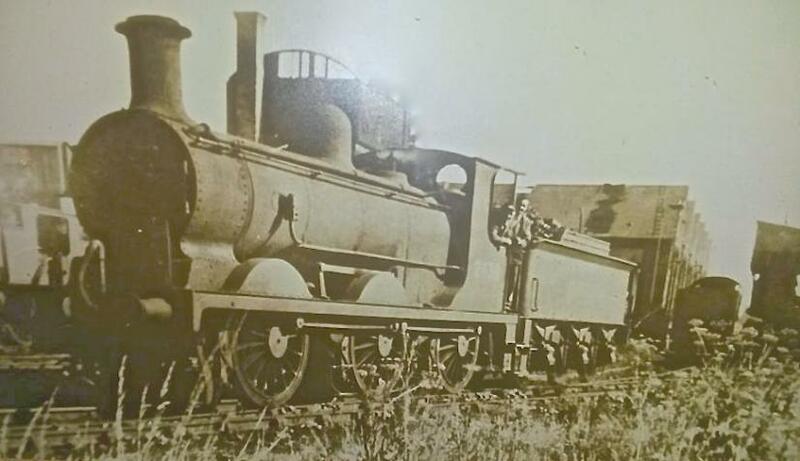 On the 8th June, 1872, Driver Mills lost two fingers whilst oiling round this loco at Tunbridge Wells West shed as a result of a sudden movement despite the regulator being firmly closed and the handbrake on. 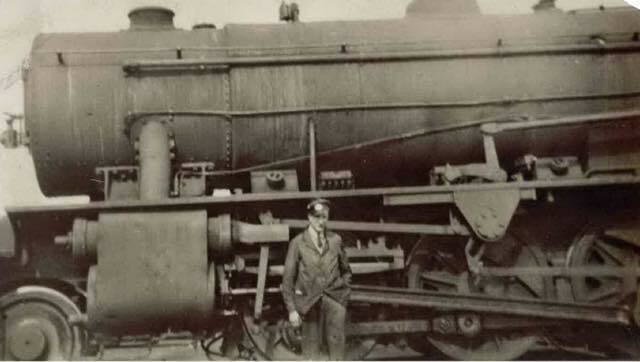 Born on October 20th 1834 and entered the railway service as an engine cleaner. July 1871 Cautioned for running by platform. June 1874 Cautioned for omitting to call at station being. booked to stop. May 1877 Fined 1/2 days for omitting to call at Barnham with train. 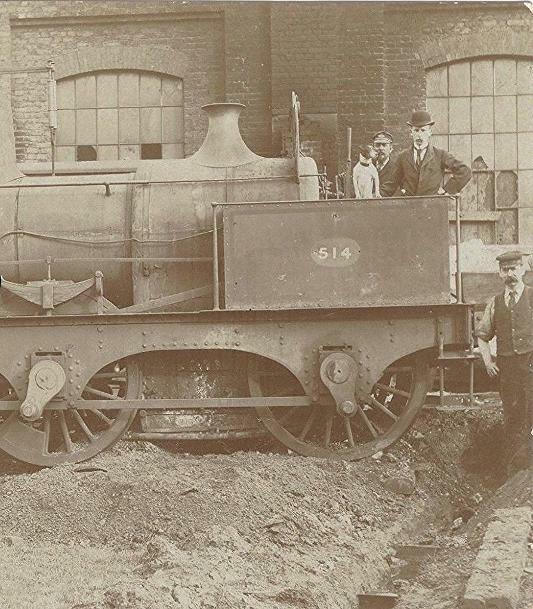 August 1877 Cauntioned for working train with defective engine coupling whereby it became detached. August 1877 Cautioned for suspected mismanagement of fire whereby a private train carriage in train was burnt. 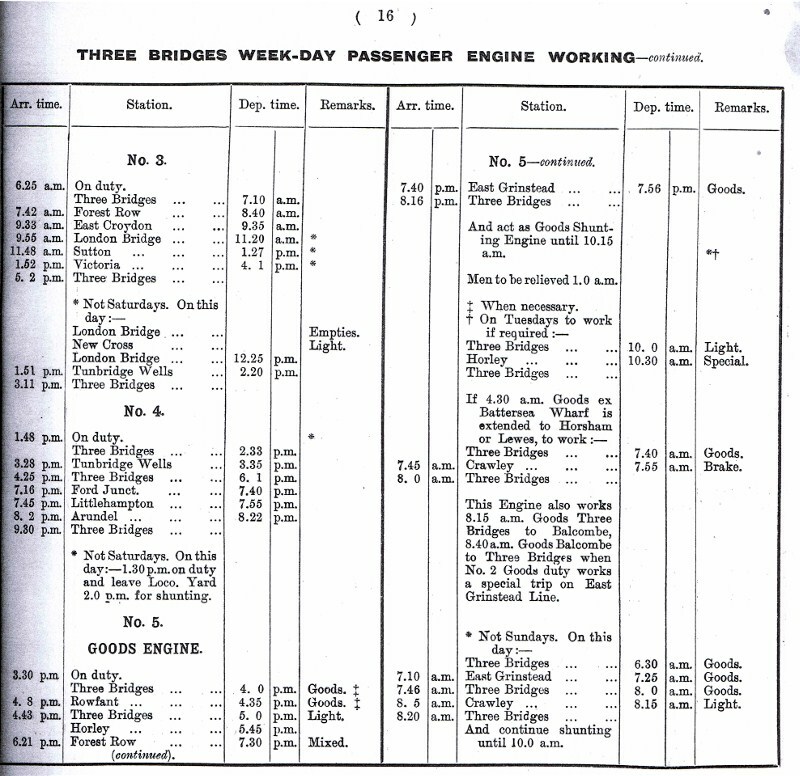 September 1877 Cautioned for for stopping foul of another road at London Bridge whereby two engines were damaged cost of repairs 10.2.6. February 1882 Cautioned for neglecting to properly examine engine and allouping pin to carry out of eccentric rod , braking a lifting link and delaying train. February 1888 Fined 1/- and cauntioned for braking drawbar fork of by the road truck by applying westinghouse brake carelessly when shunting at E. Grinstead 7/6. 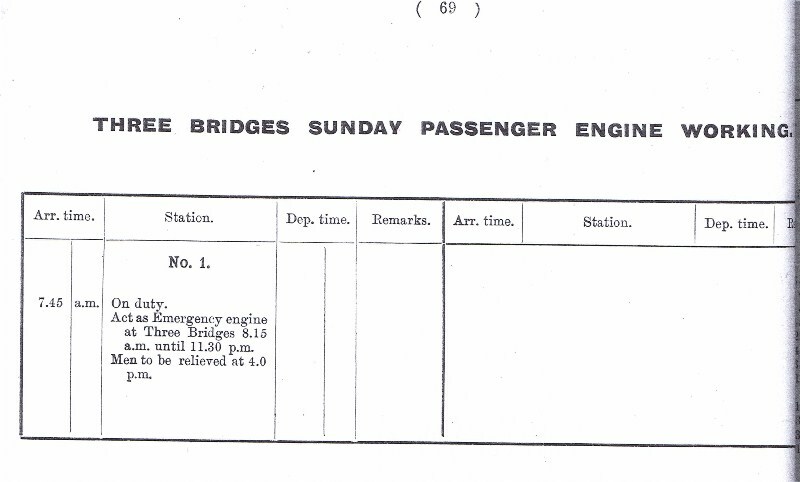 April 1889 Cautioned for mismanging engine fire whereby engine became short of steam and lost 5 mins with train. February 1890 Cautioned for losing 3 mins with 8.25 am Horsted Keynes to E. Croydon train by mismanagement. 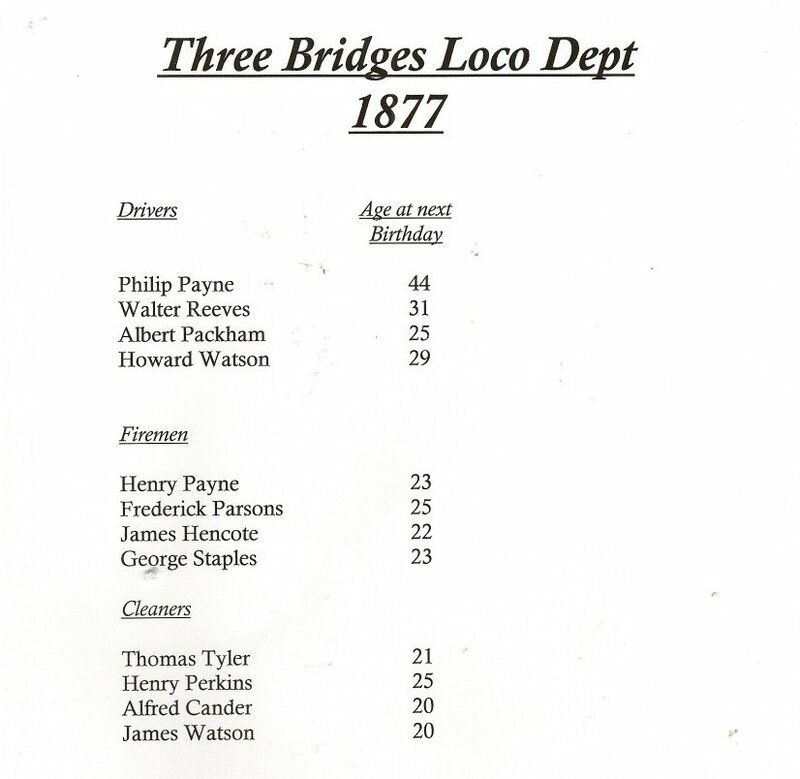 Above is a list of all the engine men that where employed at Three Bridges Locomotive Department in 1877. It is not know if this is list was compiled in seniority order or not. However, the list does clearly indicates the difference in the ages of both drivers & fireman at that period of time. Three Bridges Loco Dept. on Queen Victoria's Diamond coronation in 1897. On the Friday I travelled to Three Bridges, another small locomotive centre on the London, Brighton and South Coast Railway, where we had a few members attached to our Tunbridge Wells Branch. The object of my visit was to prepare for an open meeting on the Sunday, with a view to opening a branch Brother Harrison, of Battersea, Brother Worcester, of Horsham, and a few friends from Brighton, attended, and we had a good meeting, Brother Smith, of Brighton, was in the chair Brother Harrison explained the whole matter relating to the business done by the delegation on the electric and other matters I then talked to them on general matters relating to locomotive-men in particular, and at the close we were able to declare the branch open and elect the necessary officers for the time being, with a stipulation that I could visit them when the books arrived, so as to explain matters to the new secretary. I can assure you all that we are very much alive and can claim to be nearly 100 per cent. in membership. The very few “nons” that we do possess will, I fill sure, soon make up their minds and join up at once. Surely they can see their folly by now. Why a man is not in the union fogs me completely. Is it due to apathy? If so, I ask them did apathy get you your conditions in 1919? Will apathy ever get you anything? The reply is in the negative. That sort of thing has got to be cut out if we are to maintain our present conditions. Every man has got to do his duty by joining up without delay; and also get into that very good habit of not getting into arrears. Give your secretary a chance. I very much regret to have to report the death of our well worth member, Bro. H.A. Miller, on January 23. 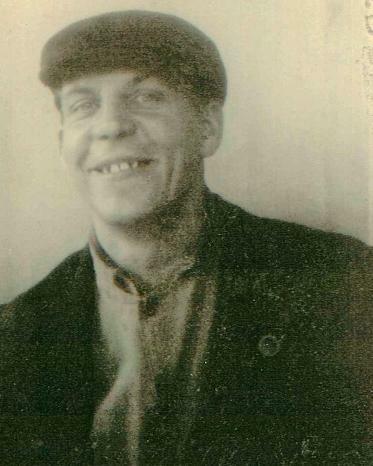 Driver Miller was one of the most staunch and true members that Associated could wish to have. His regularity at the branch-room was a credit to him. Cut off very sudden, at an early age of 37 years, he contracted an illness lasting only six days, and double pneumonia claiming his life. No man ever preached the doctrine of the Trade Union and Labour Movement more than our late Brother. In the troubles that we have had in previous years, Bro. Miller was a familiar figure. Always cheerful at the heart, he was liked wherever he went. 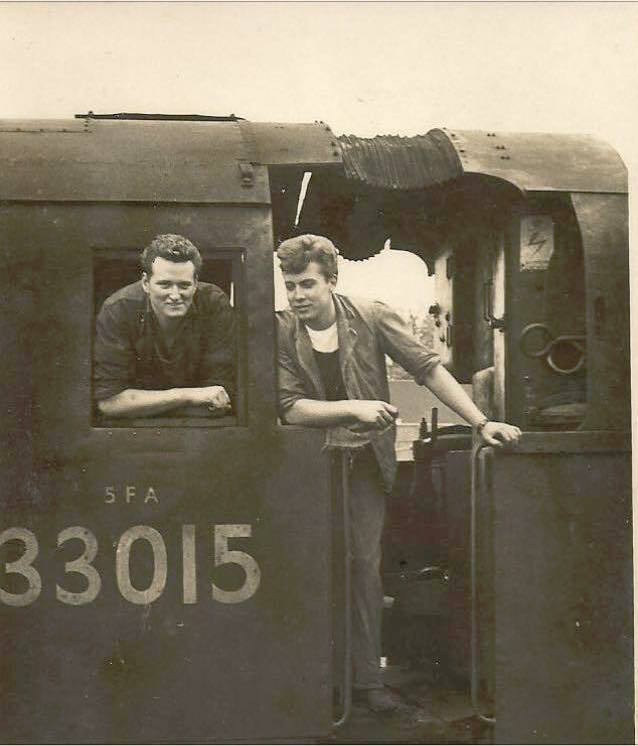 As a mate on the footplate he was great, his conversation was such that one could feel themselves being educates from him. He was never more happy than when he was talking about matters concerning trade unions or the Labour Movement. He took an active part in both. Principle was his motto of the day. In case of hardship, he was always very willing to help. So, Mr. Editor, we give you a little idea what kind of a man we have lost from our ranks. It does not seem true, even now, that he has gone. To his widow and child we extend our heartfelt sympathy. They have lost a good husband and father, and we have lost an excellent workmate. The high esteem with which he was held was evident at the funeral, nearly a 100 staff of all grades being present to pay their respects. Four acted as bearers. So good-bye, “Old Pal,” we bow our bare heads to you in respect, while you rest silent in your peaceful grave. Max Sumner, Dave Shopland, Jim Green, Peter Stark, Tim Turner, Pat Laker, Ken Drew, Archie Setherton, Charlie Miles, J. Robinson, J. Bradley, George Slight, Charlie Mapston, Gordon Knight, Percy Terry, George Rice, Colin Smith, Bill Peacock, Roger Hopkins, W “Bungy” Charman & Sid Ellis. (kneeling) Chris Burton, Ron Coveney, Fred Stoneman, Bill Barratt & Charlie Stokes (Branch Secretary). There are number of striking ASLEF members missing from this photo, due to them not having any transport to able to attend the strike meetings. 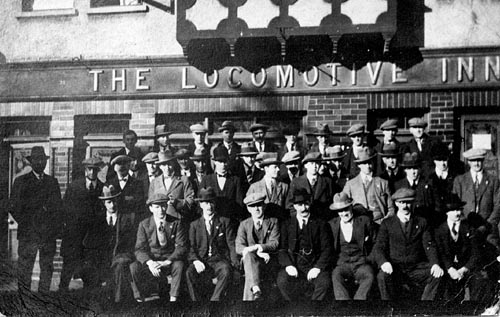 The Locomotive Public House is now known as the “Moonraker" which is situated in Three Bridges Road. For those like myself seeing this picture takes you back to those days of friendship and fraternity, it seems that it only happened a few years back. Engineman George Taylor did move to Horsham and lived at Christ Hospital, his wife unfortunately was killed by a train there. Archie Setherton moved back to the West Country as did Ken Drew. Peter Stark became a Driver at Selhurst before moving over to management. Les Wilson although a member of the N.U.R. Joined us for the strike period. 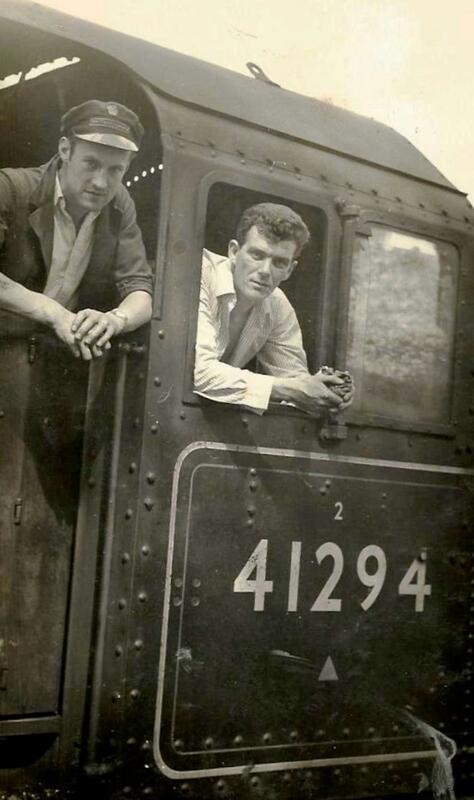 Ray Young was absent as myself and Jack Owen had taken a message to Fratton Depot. Bob started at Three Bridges around 1954 and left about 1960 to go into Industry. Sadly I cannot remember many of the cleaners or firemen of the time. I can remember drivers like Ray Young, Dave Shopland, Charlie Pope, Jack Owen,(Who was my best man),Charlie Mapston (Jack Owen's father in law), and Tich Robinson. Apart from Ray Young and Tich Robinson are the only other drivers I worked with., and my last driver was Jim Burtenshaw. The only firemen I can remember was, Albert Baptiste and Robin Baldock. 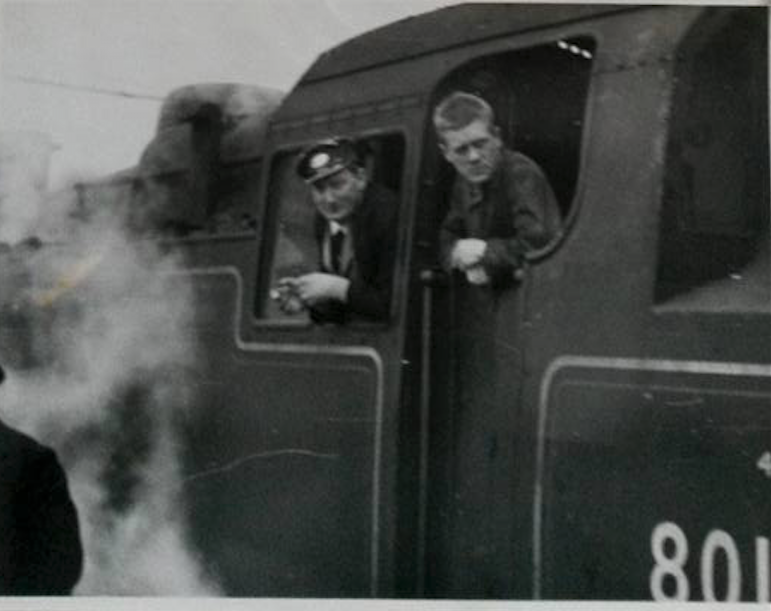 If I remember right he was a signalman when I knew him, and he was a friend of Syd Vallance, a leading porter at Grange Road. Together we all started a model railway club In East Grinstead. 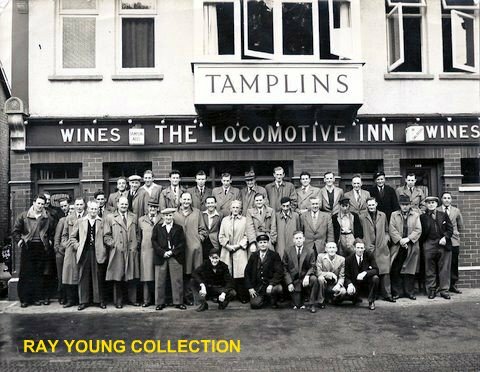 Nobby Clarke left the railway and went on to be a pub landord. 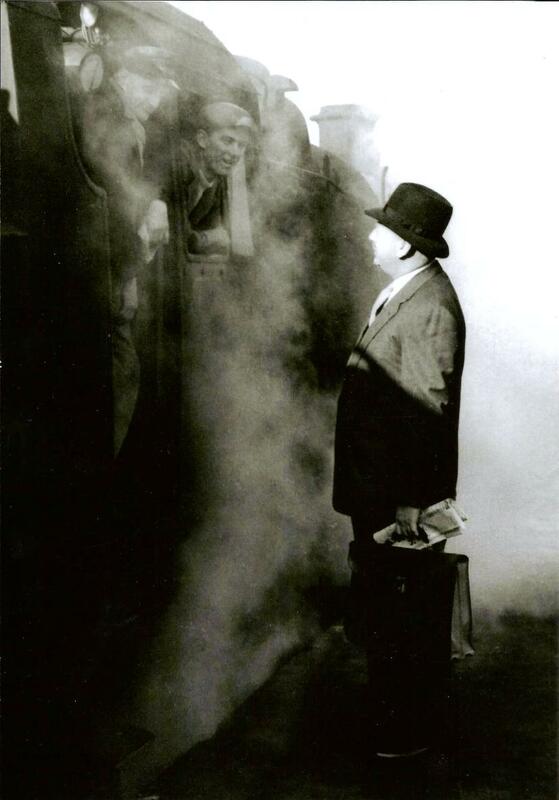 Driver Bill Peacock is seen standing in the doorway, the photo taken in the 1950s. It is believed the fireman seated could be Alf Pelling. 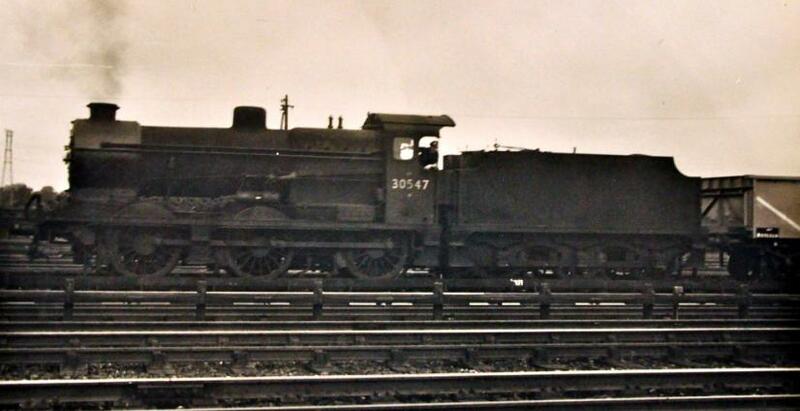 It is also believed that Alf was at Three Bridges for a time before returning back to Brighton loco. and his fireman Dave Thomsett. Whilst Peter Clark was working a L.M.S. 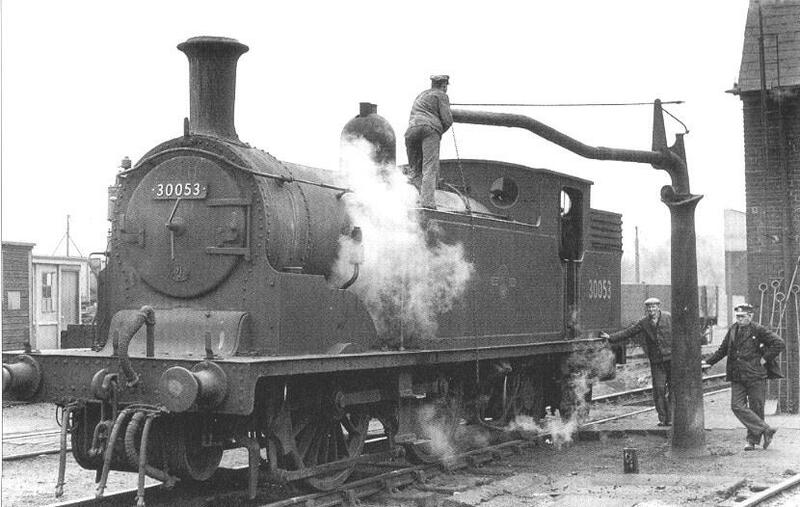 Fairburn tank loco No. 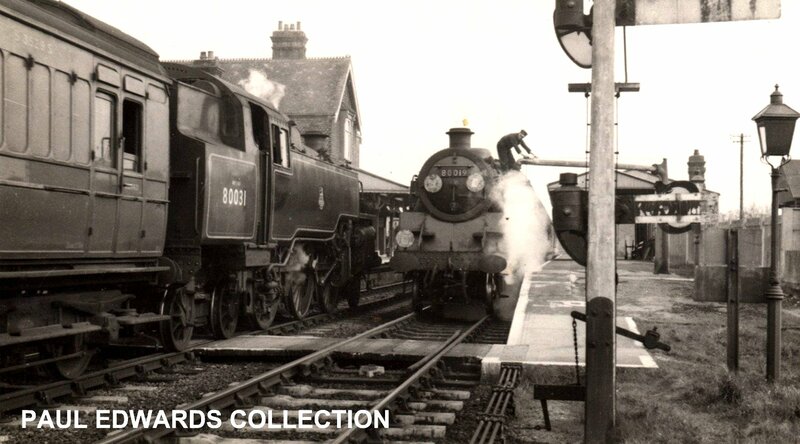 42086, a collision took place at Hassocks station. It is understood that the collision was due to the down side ground frame was not interlocked to the Hassocks signal box and was left open. 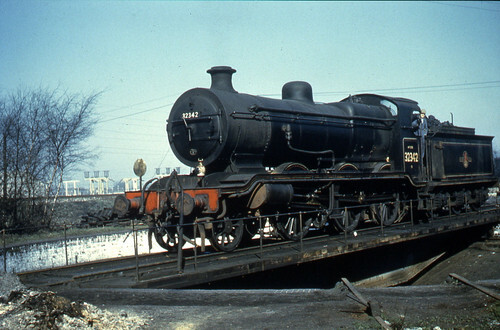 When the driver Peter Clark was given the tip by the shunter to leave the yard, the train collided with a down train a 4-SUB No 4276. The driver remembers seeing his fireman's boots disappear out the window as he lept out. There is no M.O.T. report in to this accident. When the driver Peter Clark was given the tip by the shunter to leave the yard, the train collided with a Up train the 4SUB No 4276. The driver remembers seeing his fireman's boots disappear out the window as he lept out. Dr. Beeching’s first day at B.R. 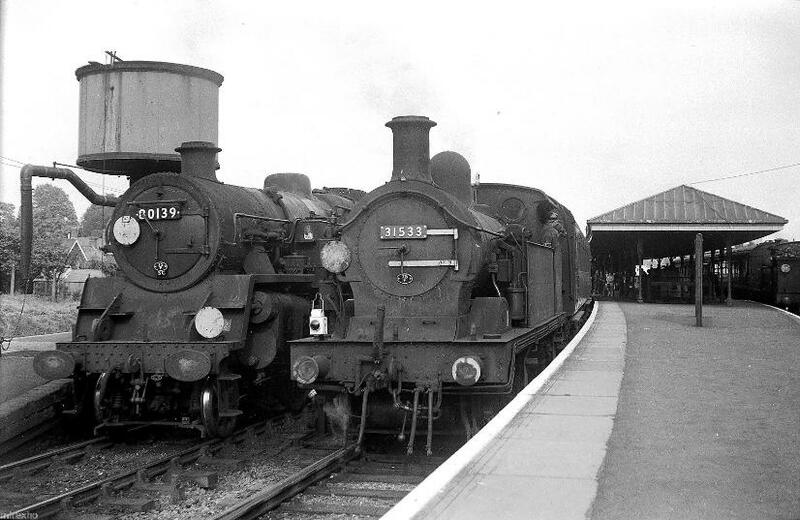 joint the train at East Grinstead, asked by Dr. Beeching, how is the coal, Fireman Chapman replied “CRAP”. 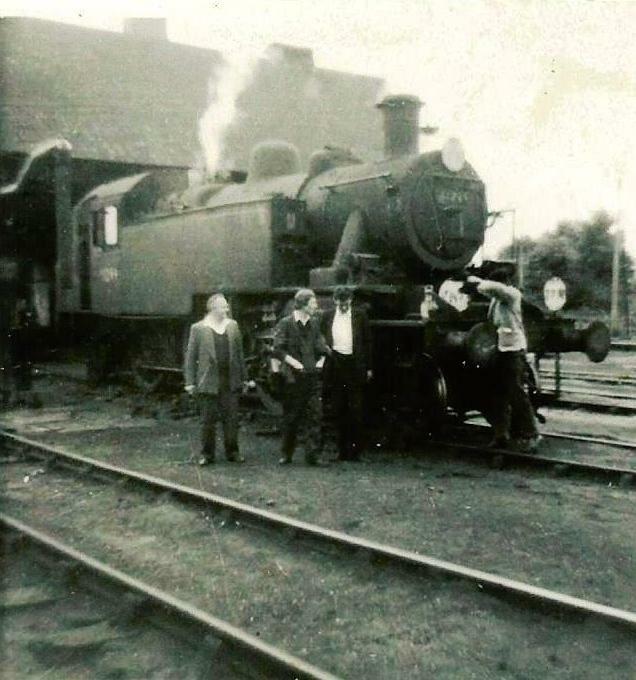 The little boy standing next to the loco on the platform is Brian Baldock (no relation to Robin), he went under the name of Bazil Brush, and finished up at Tonbridge. Robin Baldock's Fireman P. Butler (Ducky), who went on to become a driver at Caterham. Ken Ellis at Three Bridges in c1952. 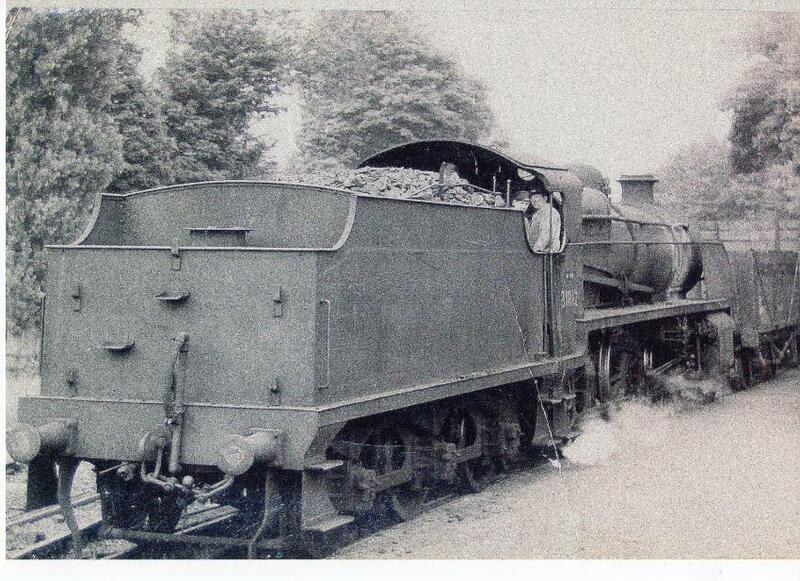 Chic started his footplate career at Three Bridges on the 27.07.1953. This "slight" mishap took place at Tunbridge Wells West. involving Driver George Slight. and his fireman Fireman Tom Oakley. The date is uncertain and there where no injuries sustained only to the engine P2 "Teddy Bear"
Above 30056 with a Three Bridges (?) 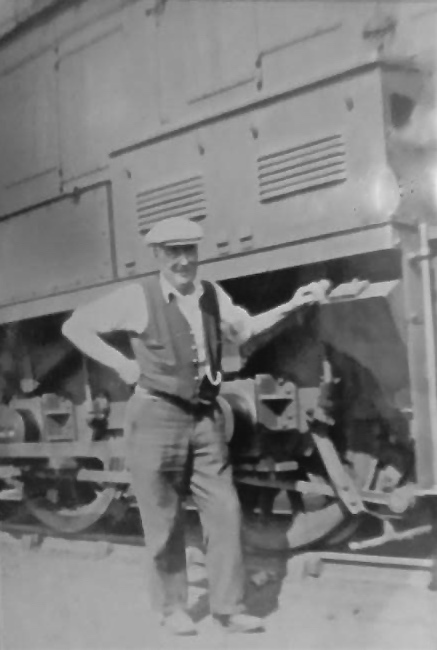 Footplate man (any idea who he is?) 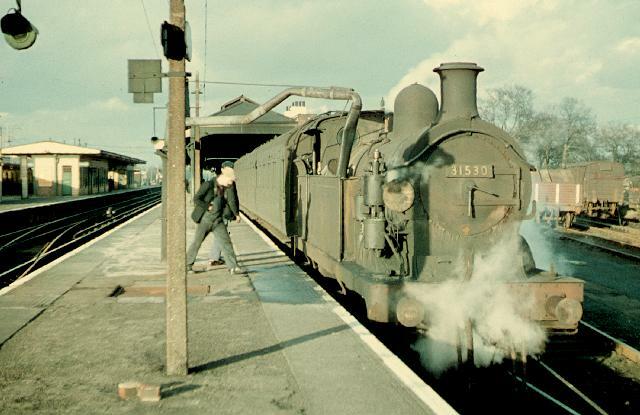 at Three Bridges down bay platform in c1952 with a Three Bridges Tunbridge Wells West push/pull train. Robin is the on the left, and is about to throw a bucket of water over the bunker.